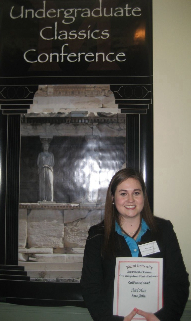 CONGRATULATIONS to Anne Flatin ‘09, who won third prize for her paper at the at the 8th Annual Undergraduate Classics Conference at Miami University in Ohio in February 2009. Here is Anne's report: "I was privileged to present my paper "When There's No More Room in Hell: Defining the Ancient Zombie." The conference was divided into several panels over two days; after each panel the presenters would field questions from the audience. This gave those of us in the audience, professors and undergraduate presenters alike, an opportunity to really engage with the presentations. On the second day of the conference, prizes were presented, and I was thrilled to receive 3rd place. Thomas Miller of Harvard University received 2nd place, and Mary Anne Marks, also of Harvard, was awarded 1st place. Not only was it an honor to place alongside these brilliant scholars, but also it was a privilege to meet so many gifted students of the Classics from across the country. I am extremely grateful to the Classics Department of the College of William and Mary for presenting me with this opportunity and for their continued support during the process. (Anne's participation in the conference was supported with Hogan funds). 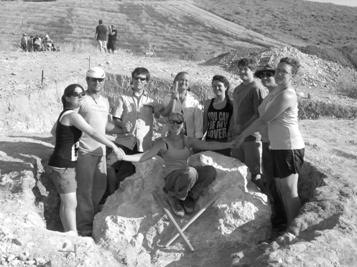 Ann Glennie ‘09: "With the Hogan Fund Scholarship money I received last year, I returned to the Poggio Civitate Archaeological Field School, an Etruscan site near Murlo, Italy. The summer of 2007 I attended as a student, but as a second year student in summer of 2008 I had more responsibilities. At work on site I helped a seasoned trench master to teach first year students the ropes of archaeology and to run her trench. The closest big city is Siena, which students can take day trips to on the weekends, and we were even given a day off to see the famous Palio horserace in July. The area of the site we worked on this year is one thought by many to be an early Etruscan temple. The most exciting work I personally did involved digging out a hole carved into the bedrock just outside the temple's foundations. The first 10 centimeters was packed with pottery sherds and animal bone pieces. Below that level, the soil changed color and was filled with small pieces of carbon. Upon further inspection, we discovered that the small balls of carbon were actually grape seeds, and may have been some sort of votive deposit. I spent two days slowly excavating and bagging up soil samples wearing gloves and using the tiniest trowel we could find to dig out the small opening." Sophia Gayek ‘09: "Salvete, omnes! I spent much of the summer of 2008 in Italy learning about classical archaeology, with financial help from the Charles Center and the Classical Studies Department. I studied at the San Felice Archaeological Field School in Gravina, Puglia - roughly the instep of the Italian "boot" - where we continued the excavation of a first-through-fourth century Roman working villa. My group at the site uncovered a lime kiln: a circular kiln where blocks of the local limestone could be "baked" and made suitable for mortar and other uses (no, I'd never heard of such a thing, either). Although it was a lot of work, the people, the site, and the town made it a wonderful experience. The field school took us on trips to southern Italian points of interest, including Pompeii, Herculaneum, and the Bay of Naples, and on my own I visited Rome and environs. I was thrilled to see the Forum Romanum, Colosseum, Pantheon, and other major landmarks, and to visit the villas of Hadrian, Horace, and the Quintillii (despite misadventures with the bus system). It was the trip of a lifetime, and I am very grateful to the Classics Department for help with planning and funding." Laura Helferstay ‘09: "Food and its consumption is a central feature of any culture and can serve both as a connective force through time and as a defining aspect of that culture. Ancient Roman dining customs have always interested me, and I really wanted a chance to study them in depth. I've also always wanted to go to Italy and see all of the things I've been studying about first-hand, but I've never had the money. But, when I was trying to decide what to do for my Monroe project, I realized I'd like nothing better than to go to Italy and study the development of Italian food culture. So, I spent three weeks this summer in Italy and Germany visiting museums and experiencing modern Italian food culture for myself. I visited Rome, Florence, Venice, Naples, Pompeii, Ostia, Orvieto, Berlin, and several other cities. The museums were amazing and the sites were spectacular. When I came back, I continued my research using literary sources, culminating in a 15-page paper and a short presentation. My experiences this summer were amazing, and I'm so grateful that I had this opportunity." Nathan Self ('10) participated in the annual Eta Sigma Phi conference in Memphis, TN, with the presentation "Stairway to Homer: Adapting Rock Lyrics in Attic Greek." 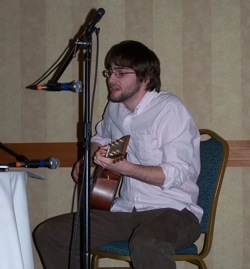 Nathan performed three songs. Click HERE [PDF] to find the program notes attached (handout images by Keith Massie).